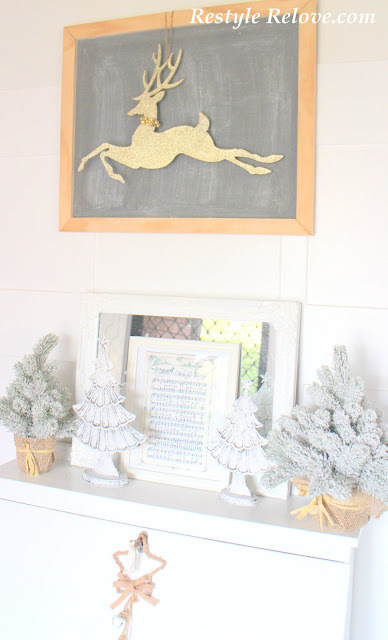 On my entry chalkboard I added my gold reindeer. 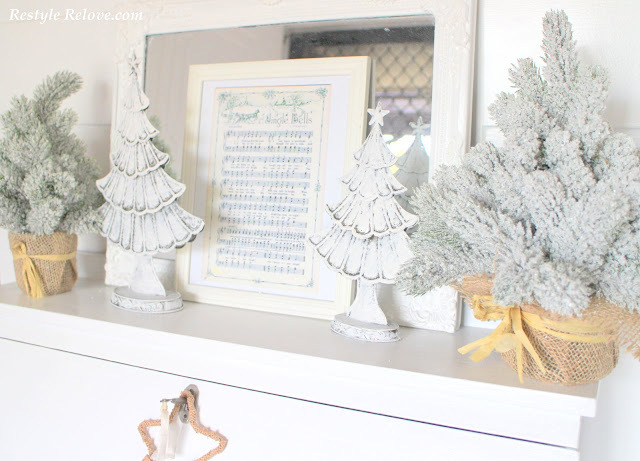 And on the secretary I added my favourite little flocked trees, with my favourite tin trees and framed Christmas carol. 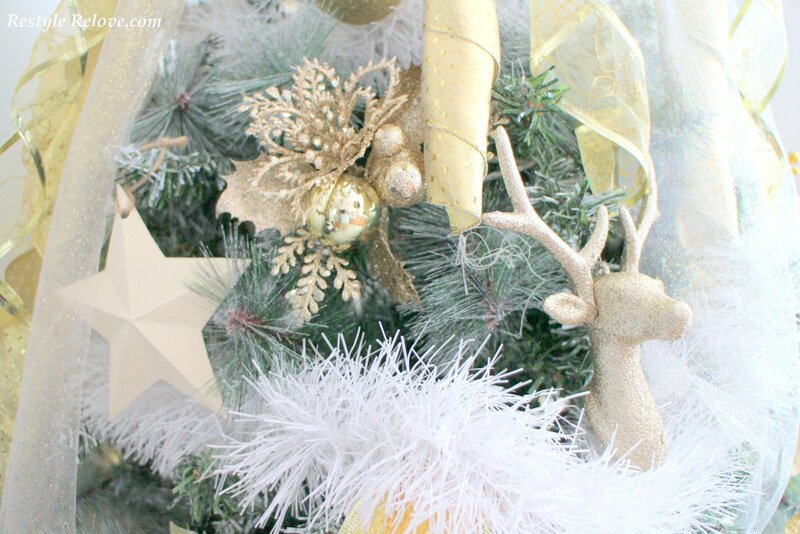 Lastly, a hanging star and bells ornament on the lock key. 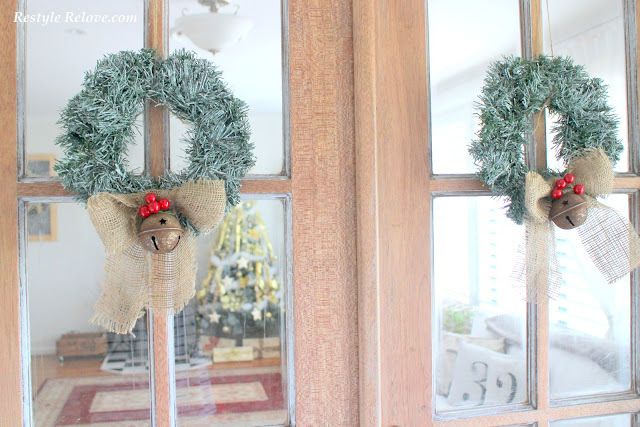 I hung two gorgeous little wreaths with rusted bells and burlap bows. So here is our living room, and our tree. I went with a predominately neutral and gold theme this year. Adding lots of sprigs and stars and baubles and reindeers. 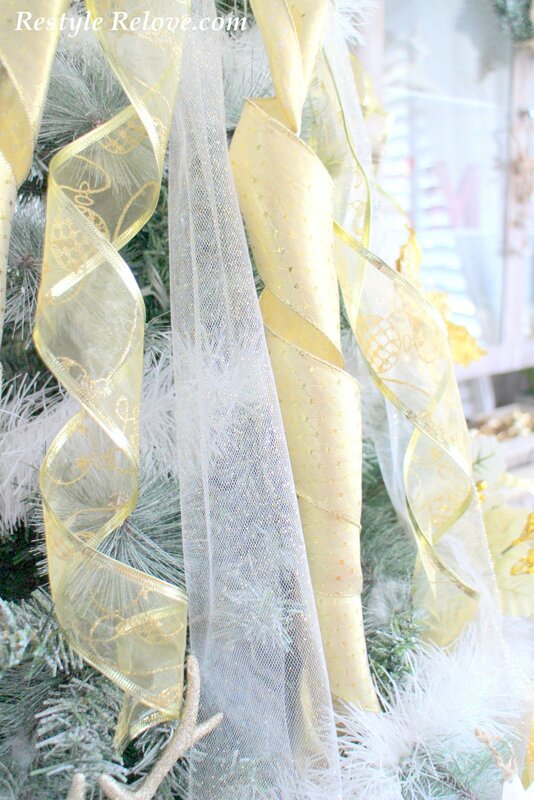 And a white tinsel garland wrapped around. 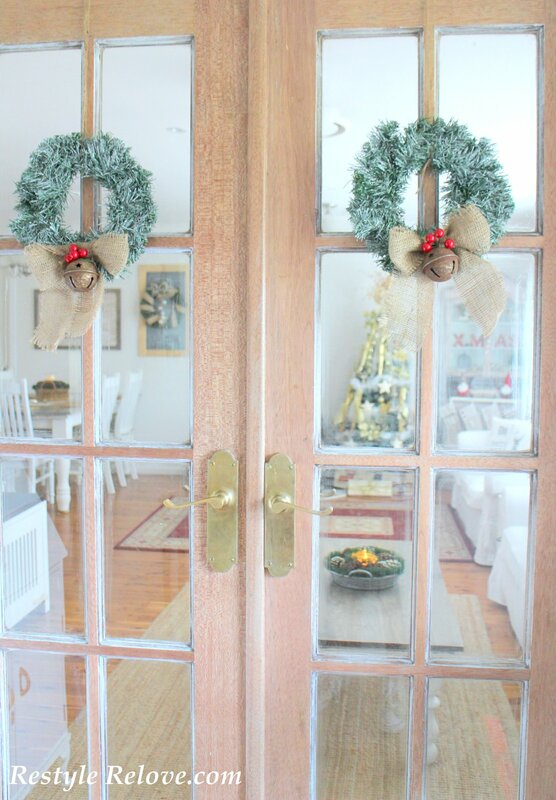 I also added clusters of curled ribbons which look pretty spectacular if I do say so myself. 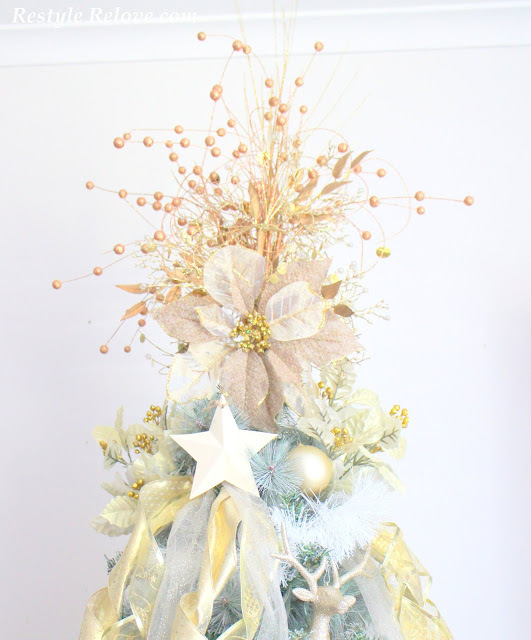 I used a large flower and various sprigs to create a fantastic tree topper. And to place my tree in this year, I purchased this beautiful wicker basket. 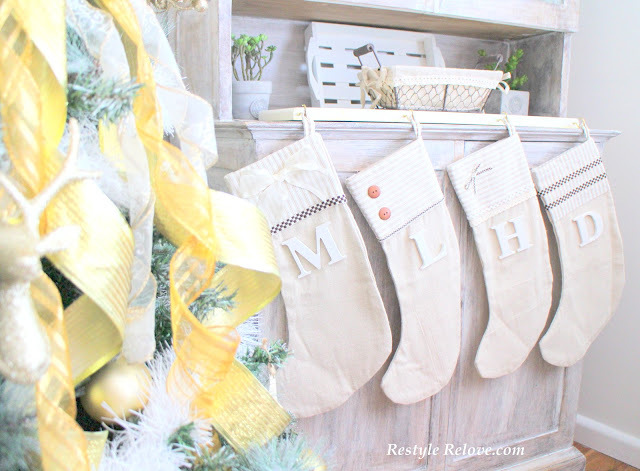 I made a stocking hanger from an old plank of wood and some old hooks. 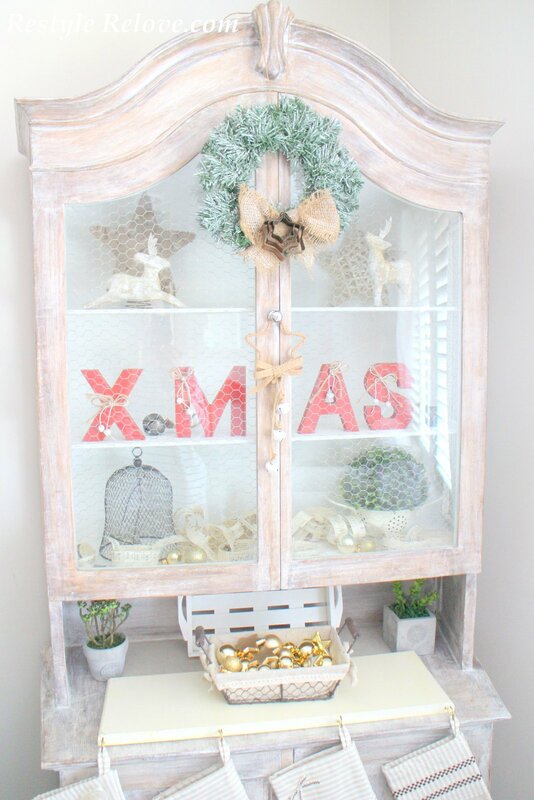 I also added lots of Christmasy stuff to to our display cabinet, including the red Xmas letters I purchased on sale last year. 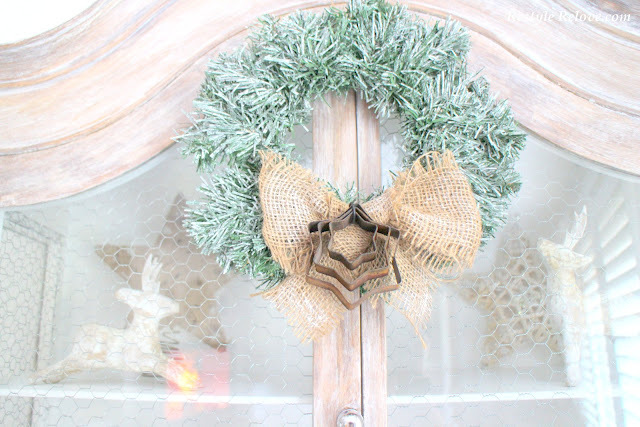 I loved the wreath I created last year with rusted cookie cutters so I rehung it on the front of the display cabinet. 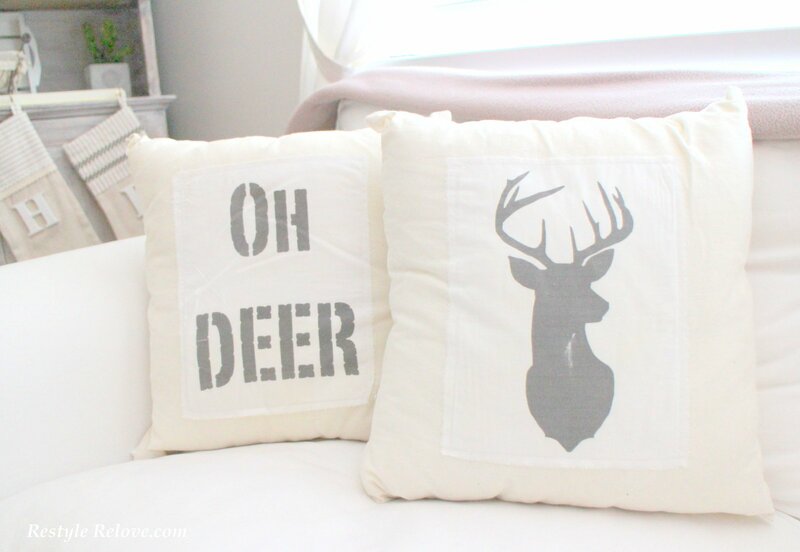 And I brought out my DIY deer cushions. I went for a very simple classic centrepiece on my coffee table. 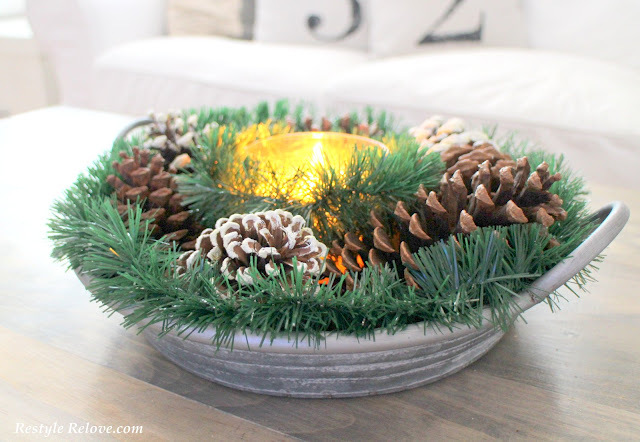 I filled my recently purchased metal tray with a candle, surrounded by pinecones and a green garland. 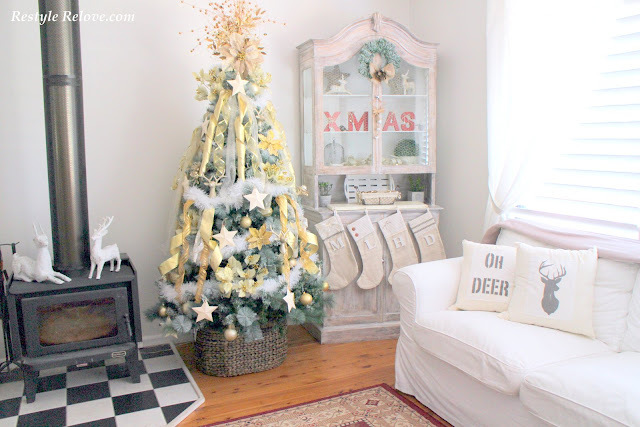 I decked out the corner next to our sofa. Hanging my DIY wooden Christmas tree and adding a cute white bell wreath to the chalkboard sign. 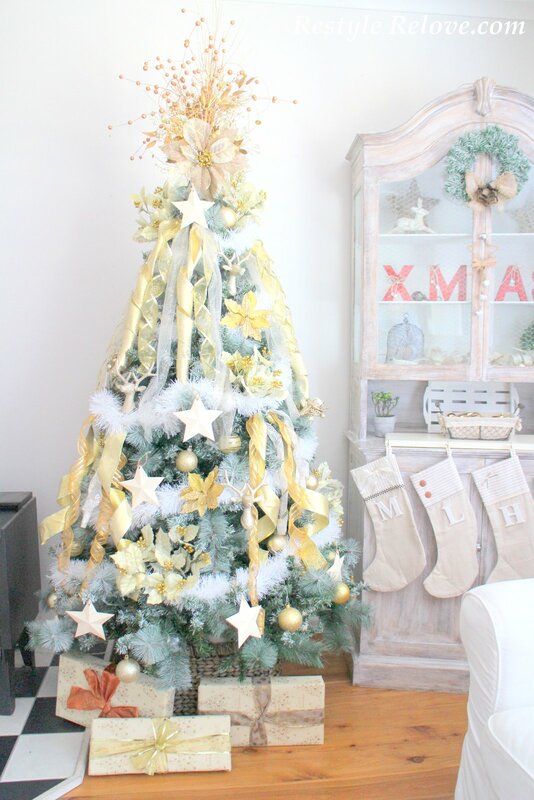 This is my wooden tree all lit up. 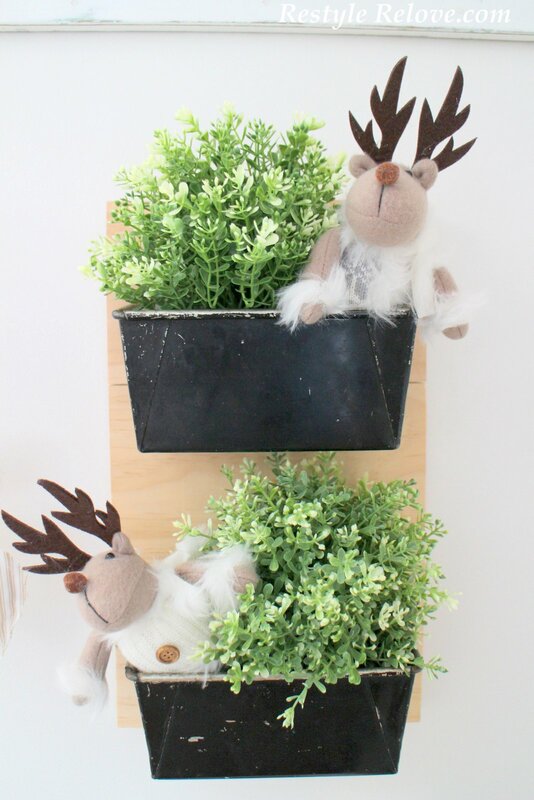 And in my old baking tins I added some cute plush reindeers that I also picked up on sale last year. 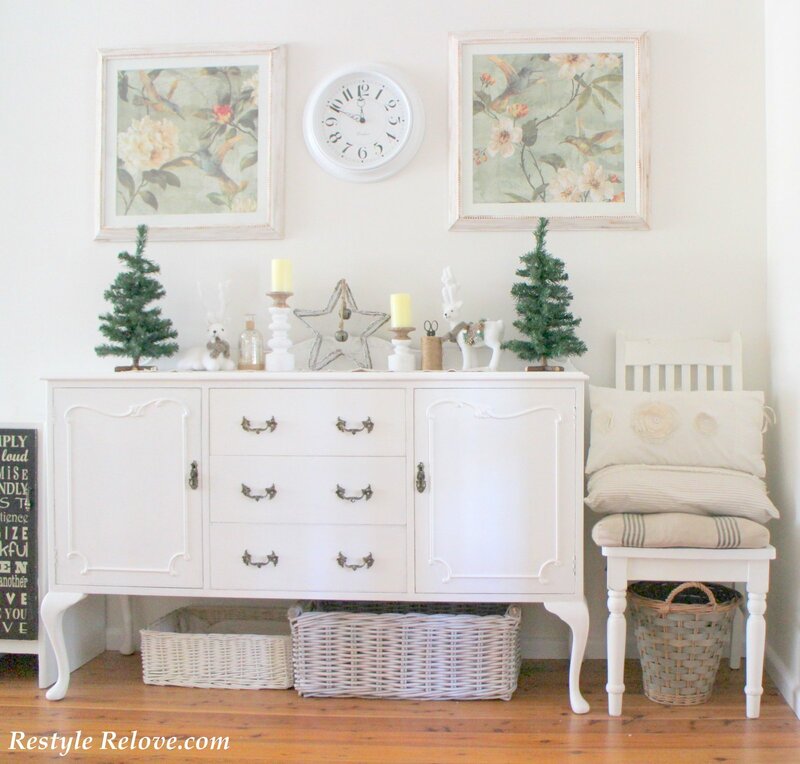 This is the corner next to the tv. 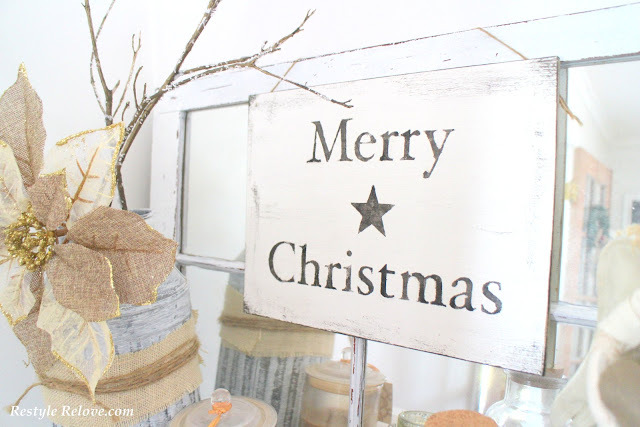 I hung my DIY Merry Christmas sign from the window mirror. 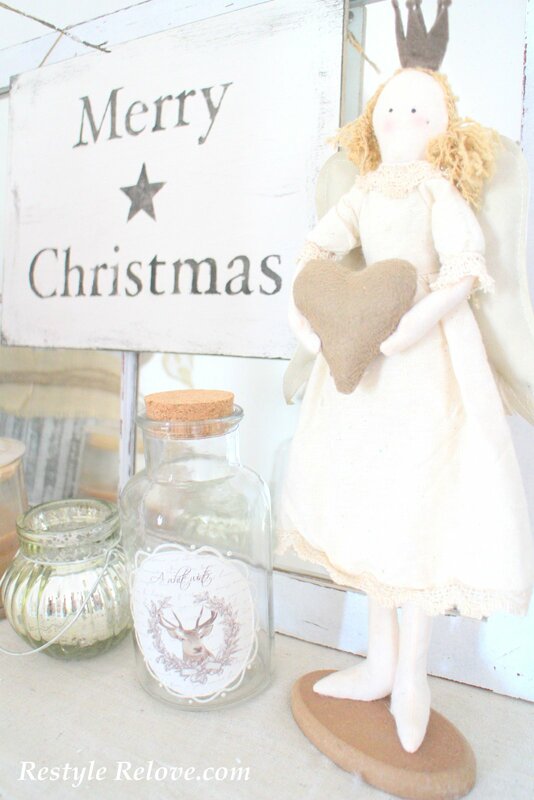 The super sweet fabric angel, glass jar and tea light candle holder were all newly purchased recently at Lincraft for half price. 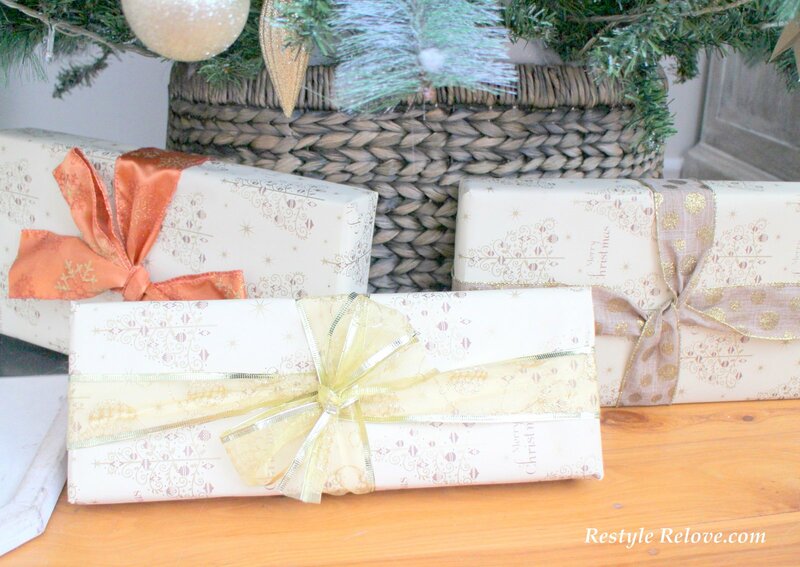 Yep, Christmas sales already. 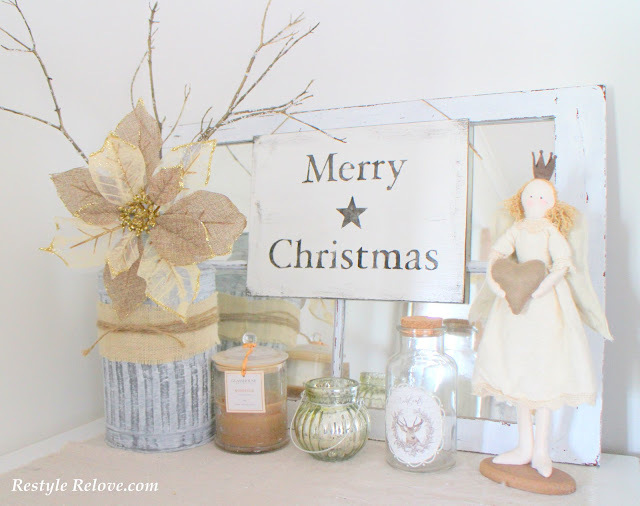 With my old milk can, I added some branches from the garden which I spray painted gold and used mod podge to adhere epson salts. 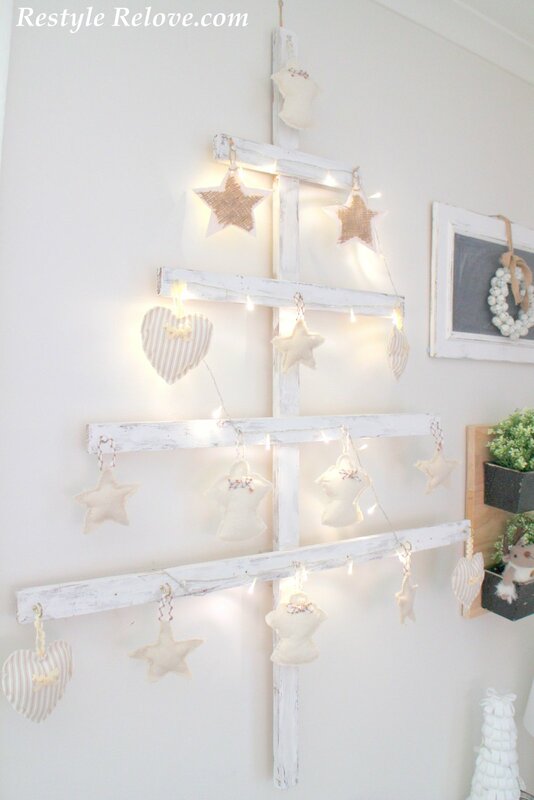 (I saw this on Pinterest and decided to give it a try.) 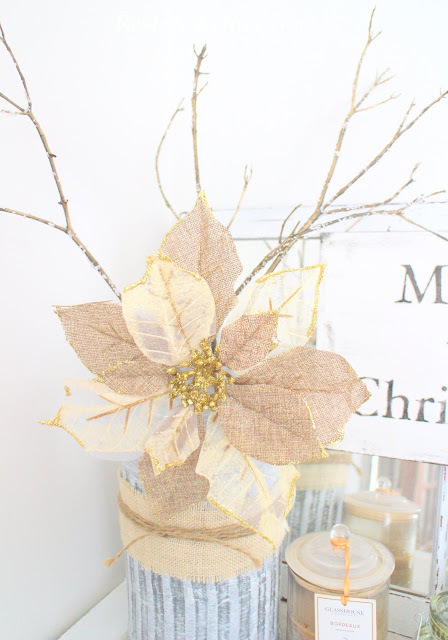 Then I added a sparkly gold fabric flower. 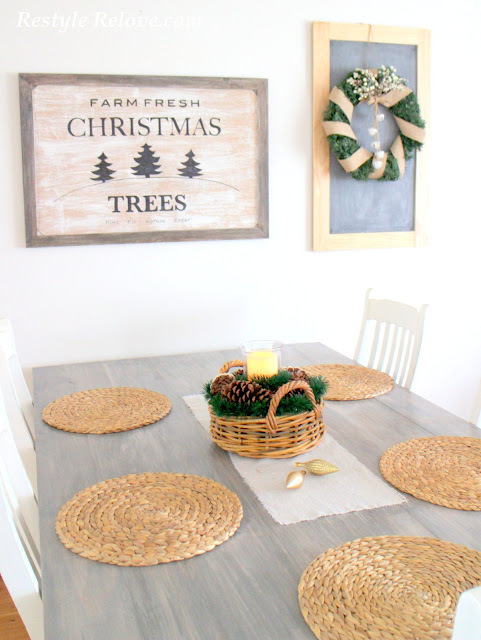 I kept the dining room very simple also. I put up my DIY large Christmas Trees sign. 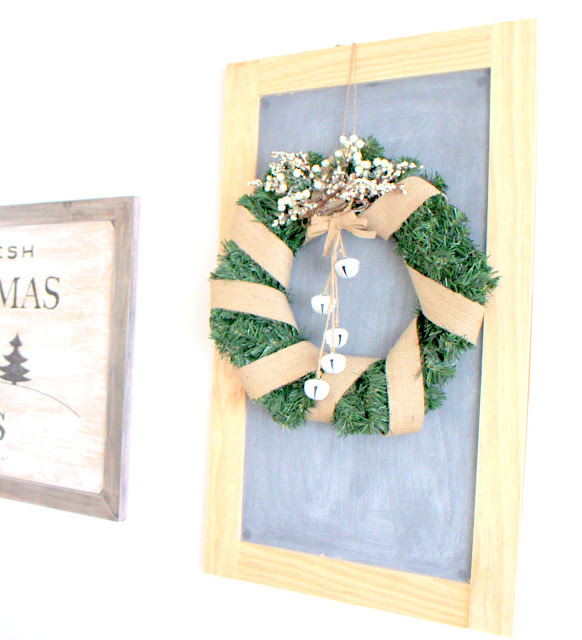 Then hung one of my large DIY Christmas wreaths on my large DIY chalkboard. 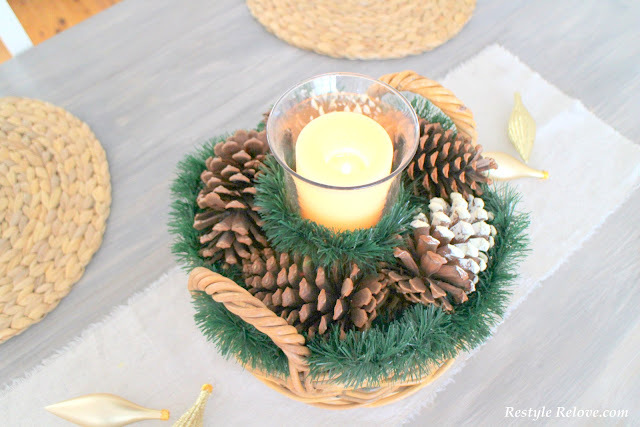 And on the table, I added a matching centrepiece in a cane basket. 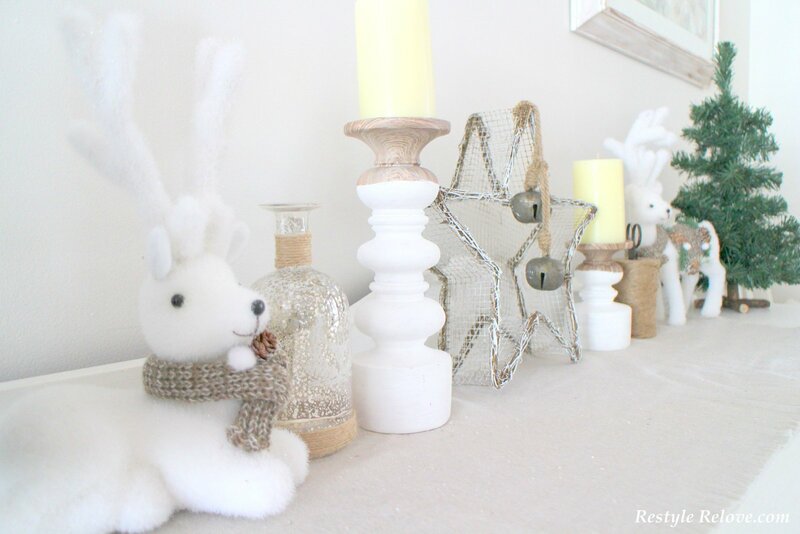 On my sideboard I added a little Christmas as well. 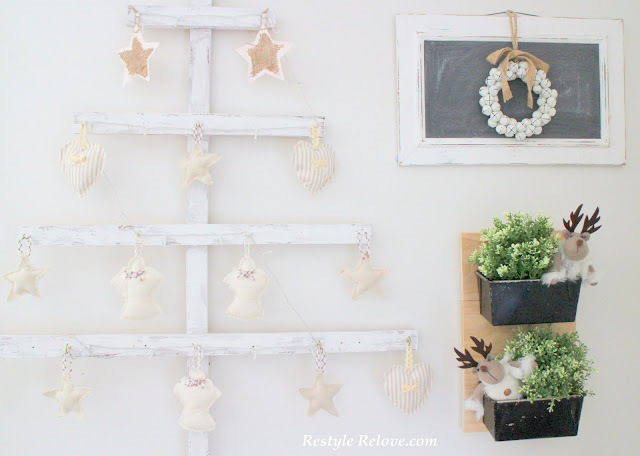 Two small faux trees, two cute reindeers, together with my wicker star and candles. I hope you enjoyed my Christmas Home Tour. It all looks so beautiful Julie. 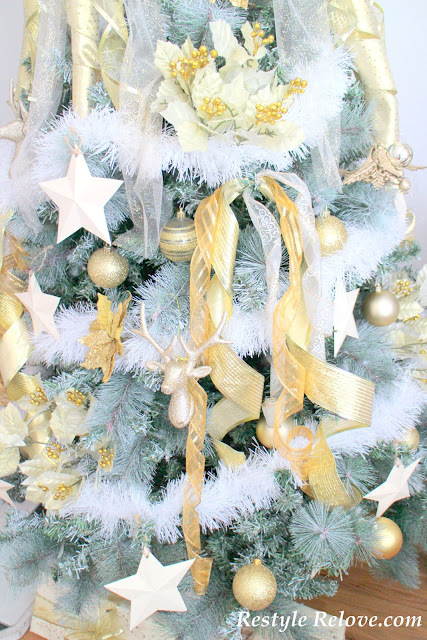 I like the neutral and gold theme and the ribbons on the tree as you have arranged them look so lovely. Julie it is all sooo pretty. Love it all. I want to come shopping in your home decor. Love that wooden tree so sweet and that beautiful angel is adorable. I love angels and she is so pretty and sweet. Happy Wednesday. Everything looks so beautiful Julie! 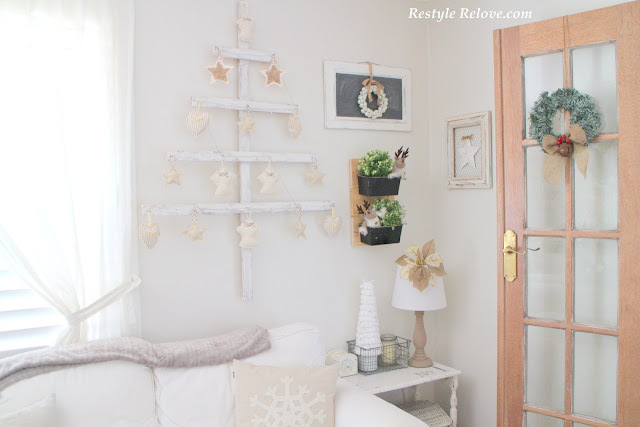 I really love that wooden Christmas tree, so cool! !